Emily Heaton sees herself as a bit of a throwback. 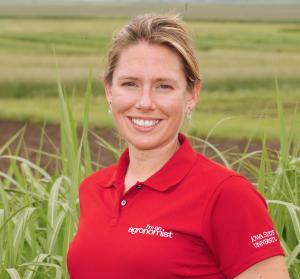 The biomass crop specialist with ISU Extension and Outreach works with perennial grasses, developing energy crop portfolios and management strategies that look at the best way to use these new crops going forward. How long have you worked for ISU Extension and Outreach? Interaction in the field with Iowans. I genuinely love Iowans and working with them. There is a better integration of science with practice here than in other places. I saw more science being put into practice here. I currently work with the University of Iowa’s Biomass Fuel Project. They commercialized a project based in part on my research and I run the agronomy experiment arm of the project. We are working to mix coal with Miscanthus to run their power plant. The goal is for their power plant to be coal free by 2025. My first love is trees. I try to have as many of my meetings as possible outside on the trail in Brookside Park. The usual. Hiking, playing outside, spending time with my family. I’d like to see 10 percent of Iowa’s cropland planted in perennials. Go for the gold right? All of our research suggests that thoughtfully incorporating perennials into 10 percent of Iowa crop land solves almost all of our problems with agriculture in the state. My driving question is, how can I make the world a better place? What I’m doing to help is bolstering the economic and environmental resiliency of our state through the strategic incorporation and use of perennials.